Glamorous camping or glamping is the new rage, but a company offering the service in Oahu is facing controversy as locals worry about a commercial venture spilling over onto their beaches and bringing tourists into competition for the limited number of available public camping permits. 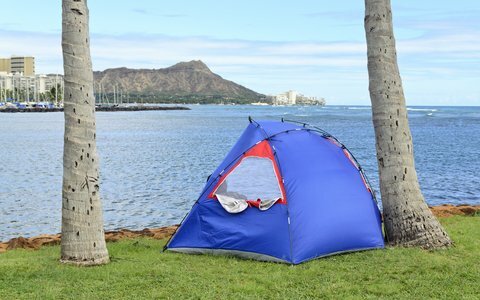 Makai Camping may have found a loophole in the regulations since the city only checks that beach users have camping permits, but doesn’t offer them commercially. The company was born when a couple couldn’t find anywhere on the island to rent camping gear and realized there was a business opportunity in helping campers who can’t bring equipment in from the mainland or from neighboring islandsm, according to local KITV. Makai Camping offers their services at Bellows Beach, Kualoa and Waimanalo Bays as well as other locations on the island. The idea is to offer convenience and a bit of luxury to campers. The basic package from Makai is marketed as economical and hassle-free, best suited for frequent campers and those with some of their own equipment. The company provides and sets up a large tent suitable for up to 10 people, and includes two camping pads, two camping chairs, and an LED lantern. Upgraded options include free-standing cooktop grills, cooler chests loaded with ice, air mattresses, and special requests such as food provisions ranging from organic raw ingredients to premade warm meals, pre-stocked beverages, arrival leis and even airport transportation to the camping site. The company is able to help campers secure the necessary permits for most of the beaches with the exception of Waimanalo Bay, but will provide services there for those who have already gotten their own permits. Commercial camping has become a touchy subject on the island lately with surrounding communities working on a master plan that includes expanding designated campgrounds so that the locals aren’t squeezed out. Makai Camping is testing new ground on Oahu with their business, but the state Parks Department reports that there are other entrepreneurs looking into similar opportunities on neighboring islands. Hawaii’s beaches and campgrounds were not set up for commercial businesses, so there may be legal challenges and more community backlash yet to come.